Augusto Pinochet attended a military college, and served with distinction in Chile's Army. He was rapidly promoted, and continued his studies at the Chilean war academy, Academia de Guerra, where he also taught. In the early 1950s, Pinochet was involved in Chile's arrests and imprisonment of communists, suspected communists, and union leaders. For about two years, Pinochet commanded a concentration camp for commies. Times change, and in 1970, a Socialist, Salvador Allende, was elected President of Chile. The U.S. Central Intelligence Agency secretly spent millions of dollars funding Chilean opposition groups, to "create pressures, exploit weaknesses [and] magnify obstacles" for Allende. Within a few years the Chilean economy was in chaos, and the CIA spent at least $11 million more to plan and fund a coup that would put Pinochet in power. Almost comically unaware, Allende gave Pinochet complete command of the Army. On 11 September 1973, the coup toppled Chile's government, and Allende was either killed or committed suicide. Pinochet promptly appointed himself President, suspended the Constitution, closed Parliament, banned opposition political activists, illegalized trade unions, and initiated media censorship. Soccer stadiums and military bases were converted into prisons, while new prisons were rapidly constructed. "Liberal" judges were fired, and suspected leftists were rounded up, imprisoned, tortured, and killed. At least thousands of people (some say many more) who spoke out against Pinochet were arrested, and never heard from again. They were called "the disappeared". During this time, the head of Chile's secret police was on the CIA payroll. The U.S. was one of the first nations to recognize Pinochet's presidency as "legitimate", and restored foreign aid that had been stopped while Allende was President. In short, Pinochet was America's man in Chile. Pinochet gave his country a new Constitution in 1980 which, among other things, gave him the absolute power to arrest, imprison, or exile any citizen for any reason with no recourse, solely on his say-so. The new Constitution, however, also established that he would face a plebiscite (yes/no vote) in 1988. As that date approached, opposition forces united and risked their lives by campaigning for a no vote, and "no" won. Pinochet stepped down as President in 1990, but under the terms of the Constitution he'd written, he remained commander of the Army until 1998. Not surprisingly, there were no prosecutions against high-ranking officials of the Pinochet Presidency during this time. When he resigned as commander of the Army, he became a Chilean Senator-for-life -- another stipulation of Pinochet's Constitution. He was arrested in England in 1998, under a Spanish warrant for crimes against humanity. 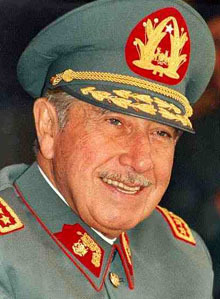 Due to his frail health, however, Pinochet was allowed to return to Chile, where his health seemed to improve quickly. In 2003, the United States came the closest it's ever come to apologizing for all this: A reporter asked Secretary of State Colin Powell about Allende and Chile, and he answered, "it is not a part of American history that we're proud of".